Had a semi-wine dinner with my super-buddies Fiona, Ken and Derek few days ago over weekend. “Semi” meaning the gentlemen brought the wine but not us girls. Maybe it should be called “Gentlemanly dinner”. 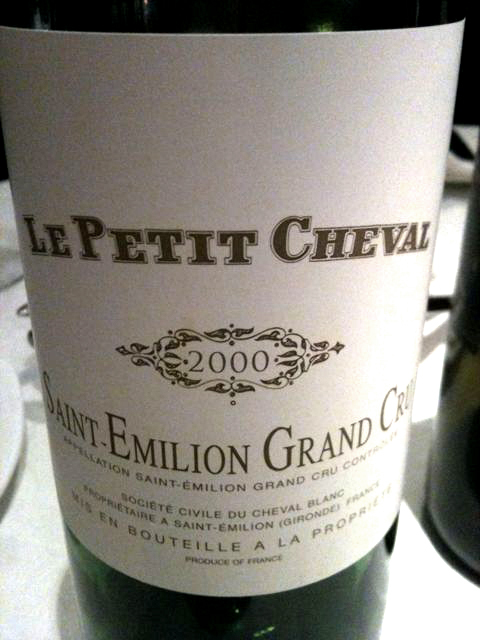 We had Le Petit Cheval Blanc and chateau pichon longueville Comtesse de Lalande 1996. While my fond memory of having Cheval Blanc 2000 still stays with me 24/7 even in dreams after the recent Acker’s tasting, it’s awesome I could taste it’s little one to reference. (Petit means “little” in french). “Oooof!! What a nose!” this little horsey’s nose is roasted coffee, bit of chocolate, aromatic and smoky! more youthful wine compare to Cheval Blanc 2000; Great freshness on the palate, ripe, balanced, velvety and silky on the attack. I’d reserve “cashmere” for the latter like how I described that beauty earlier in a magazine. A lovely tannins on the finish while the length is rather short compare to Cheval Blanc 2000, I didn’t time it but it was about a minute! For sure I was addicted to the big white horsey 2000 so much that the little one seems less favorable, it’s like older beautiful sister always overshadowing the talented little sassy younger sis. (well, like Jessica Simpson vs Ashlee Simpson (at least before all those plastic makeover). However, as Ken and Derek the wine merchant/expert suggested – for 1/10 of the price of that 100points beauty(800-1000euro per bottle), Le Petit Cheval Blanc 2000 is a just a bargin! – simply too good to be true! I agreed! so run little white horse, run to me!